China’s aggressive artificial intelligence plan still does not match up to US progress in the field in many areas, despite the hype. Chances are you’ve seen the stories, with headlines like “AI-driven technologies reshape city life in Beijing” or “Robots serving up savory food at Chinese artificial intelligence eateries” splashed across the page, a photo of a robot ominously beckoning you to believe one message: China is winning the artificial intelligence (AI) race in its quest to become the global superpower. Since 2017, China has made an aggressive push to position itself as a global AI superpower, with a government plan investing billions of dollars in the field. But upon digging deeper, it’s not difficult to find that the US remains at the forefront of the AI race, with more investment sources, a larger workforce, more thorough research papers, and more advanced chipsets. Here is the inside story of how China fooled the world into believing it is winning the AI race, when really it is only just getting started. Two moments in recent history catalyzed China’s grand AI plans. The first came in March 2016, when AlphaGo—a machine learning system built by Google’s DeepMind that uses algorithms and reinforcement learning to train on massive datasets and predict outcomes—beat world champion Lee Sedol at the game. The win highlighted how rapidly AI was advancing, said Elsa B. Kania, adjunct fellow with the Center for a New American Security’s Technology and National Security Program, focused on Chinese defense innovation in emerging technologies in support of the AI and Global Security Initiative. And since the game of Go is roughly approximate to warfare in terms of strategizing and tactics, “the success of AI in Go could imply that you could develop an AI system to seek decisions regarding warfare,” Kania said. The second moment that kicked off China’s grand AI plans came later that year, when former US President Barack Obama’s administration released three reports: Preparing for the Future of Artificial Intelligence, the National Artificial Intelligence Research and Development Strategic Plan, and Artificial Intelligence, Automation, and the Economy. “There was a similar spike in the Baidu Trends data after that—some of the Chinese policy makers thought that the US was much further ahead in terms of AI planning and recognizing the strategic value of this technology than them,” Ding said. The reports received more attention in China than in the US, Kania said. “Those plans were taken as an indication that the US was about to launch its own major national strategy in AI, which has not quite materialized since, but a lot of those ideas and policies have shown up to varying degrees in Chinese plans and initiatives that have come out since,” Kania said. In July 2017, the Chinese government under President Xi Jinping released a development plan for the nation to become the world leader in AI by 2030, including investing billions of dollars in AI startups and research parks. Meanwhile, in the US, President Donald Trump released a long-awaited American AI Initiativeexecutive order in February 2019. The order calls for heads of implementing federal agencies that perform or fund AI R&D to prioritize this research when developing budget proposals for FY 2020 on. However, it does not provide new funding to support these measures, or many details on how the plans will be implemented. Despite the ambitious plan and the hyped headlines, China is not as far along in its AI ventures as its state media would lead you to believe, Stieler said. These are the key elements of AI development where China lags behind the US, despite rampant media coverage. Chinese companies are quick to apply new technologies and test their commercial viability, Stieler said, but the different building blocks involved are not all domestic. China’s biggest roadblock to AI dominance is in its chip market, as high initial costs and a long creation cycle have made processor and chip development difficult, Ding said. China is still largely dependent on America for the chips that power AI and machine learning algorithms. However, there are motivations for China to become more self-dependent in this area, particularly considering political tensions between the nation and the US, Kania said. In February 2019, Chinese chip maker Horizon Robotics announced that it was now valued at $3 billion, and expected progress in the coming year for third-generation processor architecture. Some of the fear of China’s growing AI dominance has stemmed from research stating that the number of AI research papers from China has outpaced those from the US and other nations in recent years. A December 2018 study from information analytics firm Elsevier found that between 1998 and 2017, the US published 106,600 AI research papers, while China published 134,990. The US also has a structural advantage for research due to the number of top universities, Ding said. “Stanford, Carnegie Mellon, and MIT attract some of the best and brightest Chinese researchers, who then end up working in the US,” he added. While five of the top 10 global machine learning talent-producing universities are in China, their graduates are not staying there, according to a 2018 Diffbot report. Four of these schools—Tsinghua University, Peking University, Shanghai Jiao Tong University, and the University of Science and Technology of China—produced a total of 12,521 graduates in recent years; however, only 31% of these graduates stayed in China, while 62% left for the US, the report found. “If there is an arms race in AI right now, the battlefield is talent,” Kania said. The war for talent is occurring both among major tech companies and between a number of Chinese government initiatives trying to recruit students and researchers, she added. “The US has a major advantage here, because the majority of the world’s top universities and critical mass of talent remain in the US,” Kania said. Global distribution of machine learning talent is heavily centered in the US, according to the Diffbot report. While there are about 720,000 people skilled in machine learning across the globe, nearly 221,600 of them—representing 31% of the total talent pool—live in the US. That means America is home to more top AI talent than the rest of the top 10 nations combined, including India, the UK, and Canada. 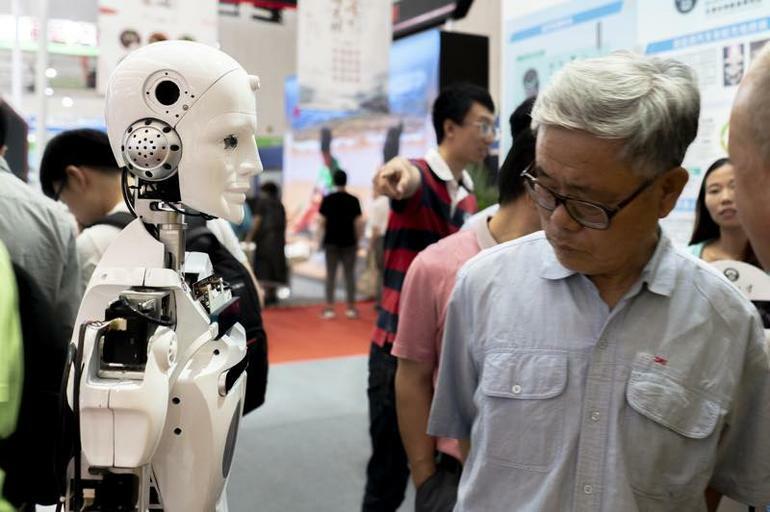 While China is rapidly scaling up AI education initiatives to build a more robust workforce of engineers and researchers, it’s still too early to know if it will be successful, Kania said. AI startups in China raised nearly $5 billion in venture capital (VC) funding in 2017, compared to $4.4 billion in the US, according to an ABI Research report. “Even though China has outpaced the US in terms of funding, the US still sees higher numbers of investment deals,” said ABI Research analyst and report author Lian Jye Su. While the US raised its money from 155 investments, China’s came from only 19 investments—indicating that investment in the East is more concentrated on certain sectors, Jye Su said. People can view the AI race from two perspectives, Jye Su said: Technology and implementation. In terms of technology, the US still leads, in terms of being home to major companies like Google, Amazon, Facebook, and Microsoft, whose AI development frameworks and tools are widely used in the industry. China’s major advantage in AI research and implementation is the sheer quantity of data created by its population of 1.4 billion and far more lax regulations on that data than exist in the US. While certain elements of AI, like facial recognition, require massive quantities of data, others require more advanced algorithms, which the US has an advantage over China on, Kania said. It’s difficult to tell whether in the future AI will still require such massive amounts of data, or if the development of new algorithms and techniques will be more important, Kania said. Major Chinese tech companies like WeChat have created an ecosystem around a flow of data that could take advantage of the AI boom, collecting user data on payments, interests, and messages, Ding said. And China has made a major push to apply facial recognition to policing and surveillance, with an estimated 200 million surveillance cameras set up nationwide that use the technology to identify and arrest criminal suspects. By 2020, the nation plans to give all of its citizens a personal score based on their behaviors captured using facial recognition, smartglasses, and other technologies. Many have raised serious concerns about how China is developing and deploying AI in terms of potential abuses to human rights and threatening the future of democracy, Kania said. “Surveillance technology is becoming very pervasive in China, but also diffusing to other countries that might see these options as quite attractive,” she added. While US tech companies are wary about working on military and surveillance applications, Chinese companies and universities are often eager to support the Chinese government and military on such applications, Kania said. However, though Chinese companies have succeeded in applying facial recognition in these realms, it doesn’t mean they can apply related AI technologies to autonomous driving or smart manufacturing, where the needs are more specific, Stieler said. Ultimately, AI is an umbrella term—the US and China are each ahead in certain elements of the technology, but are both still extremely limited in its implementation, Kania said. Both nations remain extremely interdependent upon each other in developing this technology, so one making progress is not necessarily a loss for either. While there are many reasons to celebrate the synergies among US and Chinese AI development, and much room for cooperation, it remains to be seen whether trade tensions and geopolitical competition will begin to jeopardize that—particularly in terms of military technology developments, Kania said. US tech companies should keep an eye on China’s AI work, but avoid taking claims that seem outrageous too seriously, Stieler said.